Hebrew Union College – Jewish Institute of Religion is the center of innovation for Jewish life and learning – preparing Jewish nonprofit professionals, rabbis, cantors, leaders in Jewish education, pastoral counselors, and scholars to apply their knowledge, commitment, vision, and expertise to strengthen and transform the Jewish community and larger world. 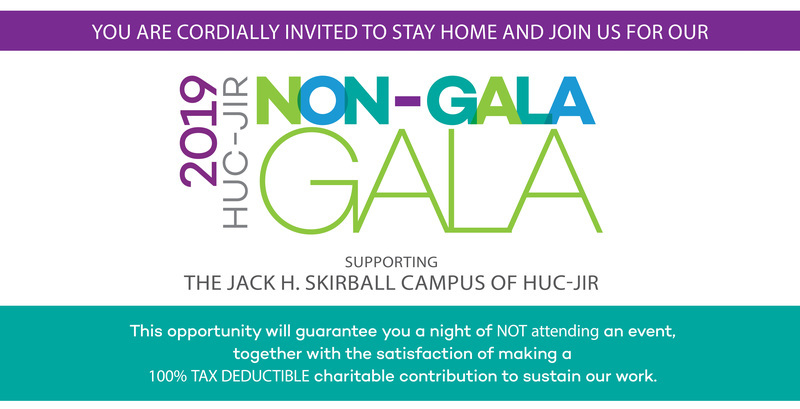 This "Non-Gala Gala" is an opportunity that guarantees you a night of NOT having to attend an event, as well as the satisfaction of knowing that your 100% tax deductible charitable contributions are helping to ensure the vitality of HUC-JIR. Your generous gift will be directed to our Annual Fund, helping to forge a new generation of inspired Jewish leaders who will guide our communities and sustain a vibrant and relevant Jewish future. If you would like to make a pledge, please contact GalaLA@huc.edu.